Its been such a long while since we caught up. So I thought I would write. Odd really in an age when we are overwhelmed with information, images, texts, updates and emoji’s I actually think the human race is communicating less. An age where a status update is carefully constructed but writing a thank you card is considered quaint. Where love letters in the sand are an Instagram opportunity, once you’ve found the right filter that is. I still have your photo’s by the way, the ones from your photography course, I cant quite believe it was 27 years ago when my best friends and I posed for you (can you even believe I married the one you always felt I was too spirited for), we thought we were so grown up, we of course were not. I’m so glad we didn’t have mobile phones then, there was something to be said for waiting in the hallway waiting for the phone to ring, to staying up too late talking into the night whilst freezing my backside off sitting on the stairs, searching for working telephone boxes after forgetting the time and waiting for buses because we couldn’t afford cabs, Uber was just a word used by cool kids. I think it must be so much harder being a teenager now, so much less freedom to grow up, so much less that is guaranteed real in life. I’m so blessed with the young adults in my life, but then you always were so good with children and young people. You knew their worth and valued their energy, perhaps that’s where I get my passion for encouraging them to dream, if they’re not dreaming then what chance do they have of living their lives to their brightest potential?. I’m so proud of them, I wish you could have met them. Its been a strange time, I never did grow out of being the slightly awkward, self doubting teenager. I just got a little wiser to my demons and learned how to put them on their leashes. I fell in love with wonderful men long before I understood that Love did not have to mean pain, sadness and barricade’s, strange given that you and mum were so well matched that a child could grow up so full of fear and so determined to remain for the most part emotionally detached from Life. And love. I caused too many people too much pain. There are so many things I don’t remember, memories that have faded. Was I even supposed to remember them? Was I meant to remember the sound of your voice or did my mind find a way of placing a sepia filter over things that were just too hard to bear at times? Do you know the way I write my R’s is just the same as you? Your father left you at 16 but you never spoke of how that left you feeling?. No matter what, you always focussed on what constituted a solution, I don’t ever remember you focusing on a problem (except the time I ran up a horrific phone bill and you stopped talking to me). I hope I have your optimism, your gift for being someone that’s wants to be part of the solution instead of part of the problem. 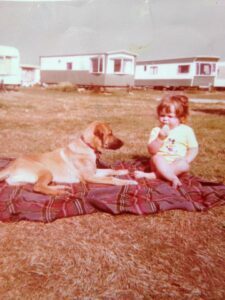 I suspect this is where my love of big dogs started, my dad rescued my beloved Mogli. I think you’d like what I do now, Its a little bizarre, granted when you walk into my flat and are confronted with ‘unusual’ pieces of Apparatus but I think you would have been interested in knowing about Mr Pilates and his Method, perhaps you might have even given it a go, even professional footballers are doing it these days, possibly even the Spurs players, though I expect they would still never admit to it over a pint of Orange juice. I get to work with people every day and encourage them in only positive ways, I get to move every day and I get to help people move. I get to be myself and however Marmite that might be for some, for others I seem to make a difference. I’ve also got to meet and even become friends with some incredible people on my Pilates journey, some of them I haven’t even met in person, but this thing called ‘social media’ has allowed me to make connections and have access to opportunities I could never have imagined. Of course it has meant saying Yes to things when every bone and instinct in my body has said to say No but then that’s when I can hear you, see you and feel you, and I remember how you always found a way to make things happen. I don’t think you knew what the word stop meant, but then those who know me say the same thing. So here’s the thing Dad, I may only have known you for the briefest time, and I know I tested you to your limits. I was not easy to love or even like at times. I’m still working on the dark days. But I’m surrounded by those who steer me always forward, strong women who shine a light to bring me out of the dark, those that help me as much as I try to help them, friends who know me better than I know myself. The ones who know a voice not a text can soothe a fragile soul, the ones I have tested to their limits and not walked away. 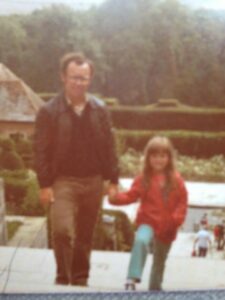 Truly grateful for my husband who reminds me that I still swish my ponytail in the petulant adolescent way I always have, proving that growing up remains optional and loves me anyway. I don’t know if you would have been proud of me but I’m proud of myself. Today 25 years ago your heart could no longer do its job and in a missed heartbeat you were gone. I hope you have gone on and not had time to look back because we are fine, I am fine. The world is not the same, I am not the same but just as you did I believe in humanity, in optimism, in goodness, in light and if I become half the person you were, this life will have been a great one even if you weren’t able to be there to hold my hand through it. Is your heart in it…. Final day on our Cyprus pilates retreat.